The Monsters I have created « You know… that Blog? Oh it has been a busy, busy few weeks, let me tell you. No really, let me tell you. Back in March, I set up a blog for the Main Street-ers to collaborate on. They’d been hanging around here for a while at that point, submitting haiku faithfully every Wednesday, and generally doing it just to make me happy. That’s how they roll, and why I love them. I already owned the domain, and it was sitting there unused, so I figured “why not?”. My friends have wonderful stories – the three of them have had (and continue to have) some fantastic adventures in their lives, and I love to hear about them. They have a lot to share, and I want to share them with you! So I set it up and did the big reveal to my darling friends ShaMoo, J-B, and Knarf shortly after. I knew ShaMoo would be the first to come around. She’s guest posted here several times, and I knew it was appealing to her! She snuck one in last month when her in-laws were headed her way. You know, I don’t think she even did it to shut me up make me happy, either. She’s a natural, my best friend. Last week she slipped another one in, and then the cheeky gal wrote the boys to issue a challenge! I was very excited. I definitely tee-hee-hee-ed out loud. If I hadn’t been alone at the time, I might have even gloated, but I was, so I didn’t. Ok, J-B, it’s all on you now, Sweet Pea! What pearls are you going to delight your fans and readers with? We know you’re full of it. Errr… stories, charm, and wisdom that is. Folks, there was one other monster I’ve created. Probably the one I’m most proud of, which of course is natural since I grew her myself. You remember how excited I was when I posted this video? Hubby and I went away for a few days last week to Thunder Bay, and when we came home, it was to a totally different Wee One. This new Wee One was doing the front AND back crawl! This new Wee One was leaping into the water unassisted… and even better? This new Wee One was DIVING! I’m not kidding! All along, she’s been learning all of this just by watching us from the sidelines. She has always known how to swim; she just didn’t know it! We spent the afternoon in the pool with her on Friday, and she was swimming along side me in the deep end, torpedoing under water, and having the time of her life. I love this pic! That is a major prize. I also want your underwater camera! Quilly – agreed! She has made such huge huge strides this summer. I’m so proud of her! The camera is great for under water shots, but not all that great for above. I find I have to do too much fiddling in Photoshop to counteract the too-bright, slightly washed out shots. Not a huge issue because the whole point is that it’s an under-water marvel, right? It definitely is that. For above I have my beloved Nikon, and even my iPhone (during the day). I noticed you guys had a new blog going on, that’s great that you managed to convince them. Great news that the wee one is loving the water. I bet you’re loving the new camera and the underwater shots. I’m still working on J-B, but the man is extremely stubborn. We both know he’ll do something though. Eventually :) He hates to disappoint, and seems to enjoy making us happy, so I have no real worries about it! 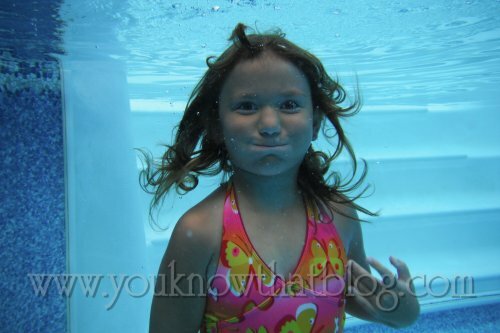 Love my camera – taking shots under water opens up so many creative avenues to explore!! Wee One is a delightful, wonderful, fantastic surprise. And relief. HUGE relief. OMG how I love that photo!! I’m so glad it finally clicked for her :). Yes, I must admit that I’m feeling quite addicted to our blog. Thanks for not pushing….tends to have the opposite effect on this stubborn princess ;). Now to wait on J-B…. Have you ever been called a nag before? *ducking from the slap upside the head ROFLMAO!!! That’s good that they are all coming around. What a great photo of the wee one. :) I’m so glad she is taken to the water so well. Excellent.